When I moved to New York City in the summer of 1982 Lena Horne had just closed Lena Horne: The Lady and Her Music at the Nederlander Theater on West 41st Street. This block was considered 42nd Street’s backside. The theater sat vacant for a year and a half before having another tenant. In 1996 the Nederlander Theater was in a better neighborhood with the rehabilitation of 42nd Street to the NEW 42nd Street and a brand new tenant, Rent. The theatre was in a general state of disrepair, a perfect environment for the gritty Rent. I’m pleased to say that the theatre has now caught up with the neighborhood and has been beautifully restored. Check out this interesting article about the Nederlander Theater. But I digressed; I entered the theatre just before “Adelaide’s Lament.” Lauren Graham (TV’s “Gilmore Girls”) plays Miss Adelaide in this production. She does so with a bit more restraint than you may be used to from this character. For those of you not familiar with this 1950 classic musical with a book by Abe Burrows and Jo Swerling and music and lyrics by Frank Loesser, Adelaide works as a singer and dancer at the Hot Box Revue. She has been engaged to high-roller Nathan Detroit, played with a stilted and pedantic meter by Oliver Platt (a Tony nominee for Shining City) for 12 years. He’s the kind of guy who always has some excuse to not commit. Playing our other on-again-off-again couple, Sky Masterson and Sarah Brown are Broadway veteran Craig Bierko and Kate Jennings Grant. Sky Masterson, another high-roller, falls for the mission doll, Sarah Brown after winning a bet with Nathan that he could take her to Havana, Cuba. Bierko as Masterson is probably the best choice of the four principals from a casting perspective. Platt, Grant and Graham’s performances never seemed to rise above average but thankfully never came remotely close to embarrassing either. All four handle the songs without any troubles but one longs to hear them sung with someone with more of a voice. The production is staged by Des McAnuff (Tommy, Jersey Boys), a man with a successful track record on Broadway. The package as a whole is a beautiful, high-quality production and a credit to its director but it never quite reaches the charm of the 1992 revival starring Nathan Lane as Nathan Detroit and Faith Prince as Miss Adelaide. In addition to getting to see the beautifully renovated Nederlander Theater, the physical production was a treat for the eyes. The set by Robert Brill replicates the steel truss of an elevated train. The orchestra is placed up stage center in a three-tiered bandstand reminiscent of the opening credits for “The Brady Bunch.” Flown in front of the band is a large LED screen upon which scenes of New York City, its skyline and even its sub terrain are animated. The video design by Dustin O’Neill is used to best effect during the second act for the crapshoot that Nathan is finally able to arrange, in the sewer. On the screen we descend below the streets of New York past steam-pipes and subways. I am not averse to new technologies in theater. I applaud it and encourage it. Unfortunately, there was something bothersome about this technology, I found the picture fuzzy. This became annoying. Additionally, McAnuff didn’t integrate this screen or exploit it to its fullest potential in relationship to the actors. The costumes by Paul Tazewell, particularly the women’s costumes were stunning. There were a number of featured actors in this production who deserve a special mention. Jim Ortlieb playing Sarah Brown’s doting grandfather, Arvide Abernathy does a beautiful rendition of “More I Can Not Wish You” even playing the piano softly onstage himself. Jim Walton as Harry-the-Horse, Steve Rosen as Benny Southstreet and Tituss Burgess as Nicely-Nicely Johnson are stand-outs. Another special mention goes to Mary Testa for a cringe-worthy performance as General Cartwright. Her shrill over-the-top delivery was jarring and irritating. Mr. McAnuff would have done well to remind her that she was no longer over at the Helen Hayes in Xanadu. My opinion aside, the night I attended Guys and Dolls the audience responded enthusiastically with laughter and applause. The trio of tourists sitting behind me enjoyed themselves immensely. The orchestra sounds great under the direction of Jeffrey Klitz. The production sparkles and twinkles and it reminds you of what a good old fashioned Broadway musical can be all about. Ah, If they had only picked another cast. 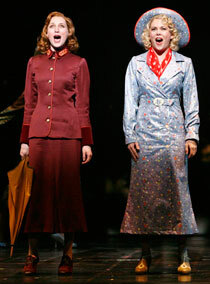 Guys and Dolls is playing at the Nederlander Theatre at 208 W 41st St, New York, NY 10036. Get tickets.